Where is the outrage on David Cameron’s scandal in the Gulf? The UAE, we now know, was busy planning its own operation against Muslim Brotherhood affiliates at home while urging David Cameron to do the same in Britain. 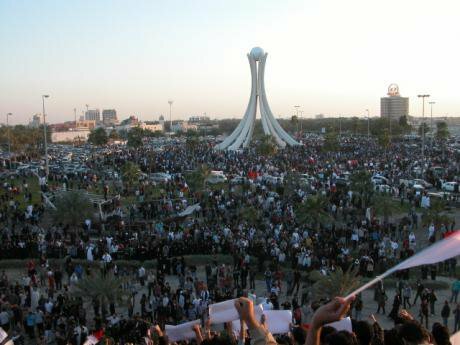 Bahraini protesters gathered at the Pearl Roundabout for the first time in February, 2011. Wikicommons/ Bahraini Activist. Some rights reserved.Whether it’s ‘cash for questions’ or ‘homes for votes’, there is often a tawdry quid pro quo at the heart of a good British political scandal. So it’s worth asking why there has not been more public outrage about explosive revelations that David Cameron was offered lucrative arms and oil deals for British businesses if he helped reign in the Muslim Brotherhood’s activities in the UK. Leaked emails obtained by The Guardian revealed that in June 2012 the United Arab Emirates tried to influence the UK to take steps against the Muslim Brotherhood in return for keeping or getting lucrative contracts. The emails suggest that the UAE government is supremely confident of its ability to influence British policy, which in turn begs the wider question as to what the UK’s priorities are in the UAE, and the rest of the Gulf. In 2013, during a Foreign Affairs Committee inquiry into the UK’s relationship with Saudi Arabia and Bahrain, MP Rory Stewart quite reasonably asked whether there is any proof that the UK can exert a positive influence over its foreign allies, where governance and the rule of law are concerned. Increasingly, the behaviour of the UK suggests that a more pertinent question is whether the UK’s Gulf policy is actually strengthening repression and emboldening authoritarian rulers in the region. Take the increasingly bloody current conflict in Yemen, for example. A senior Foreign Office representative recently told my colleagues that the British government “disagrees” with a Human Rights Watch assessment that the Saudi-led coalition may have committed war crimes in the course of air-strikes against Houthi forces. Yet on November 10, Foreign Secretary Phillip Hammond admitted that Saudi’s denial of breaching the laws of war are ”not enough” and that “proper investigations” are needed. So why did the UK withdraw its support for a UN Human Rights Council resolution back in September, which would have led to the credible international investigation Hammond now claims he wants to see? In the meantime, the UK has approved some 37 export licenses for military goods to Saudi Arabia since March, alongside technical support and British liaison personnel based both in Saudi and coalition military headquarters. Then consider Bahrain, where just weeks ago - in advance of a UN Human Rights Council session in Geneva - the UK organised briefings by senior British officials for foreign diplomats on the supposed success of Bahrain’s efforts to reform its security services (a project the UK supports with financial and technical assistance). Our research shows that Bahrain continues to torture people in detention, but thanks in no small part to the UK’s relentless cheerleading of bogus reforms, Human Rights Council criticism has remained relatively muted. And then there’s the UAE which, we now know, was busy planning its own operation against Muslim Brotherhood affiliates at home while urging David Cameron to do the same in Britain. One leaked note reveals the UAE Crown Prince’s intent to take “appropriate measures” against political Islamists in the UAE. The crackdown began within weeks, and involved arbitrary detention, forced disappearance, torture, unfair trials and new laws that enable UAE courts to convict peaceful government critics as terrorists and sentence them to death. But the UK government, which just months earlier was so effusive in its support for “greater freedom and democracy in the Middle East”, expressed no public criticism. Nor has it spoken out when its own citizens have reported being mistreated in the UAE. A June 2015 Freedom of Information request into the abuse of British nationals in police custody in the UAE revealed that between June 2010 and June 2015, 43 British complained to UK officials of torture or mistreatment within the UAE justice system. And it’s reasonable to ask if the UK government has done everything in its power on behalf of three British women whose children were taken from them after their allegations of domestic violence were reportedly not investigated by UAE police. That criticism should be coming from all corners, including Conservative MPs, and it should be extended to include the UK’s open and shameless kow-towing to the UAE. Because if reports that David Cameron may be complying with the requests of a foreign government that has reportedly tortured British citizens in detention don’t spark outrage, what will?